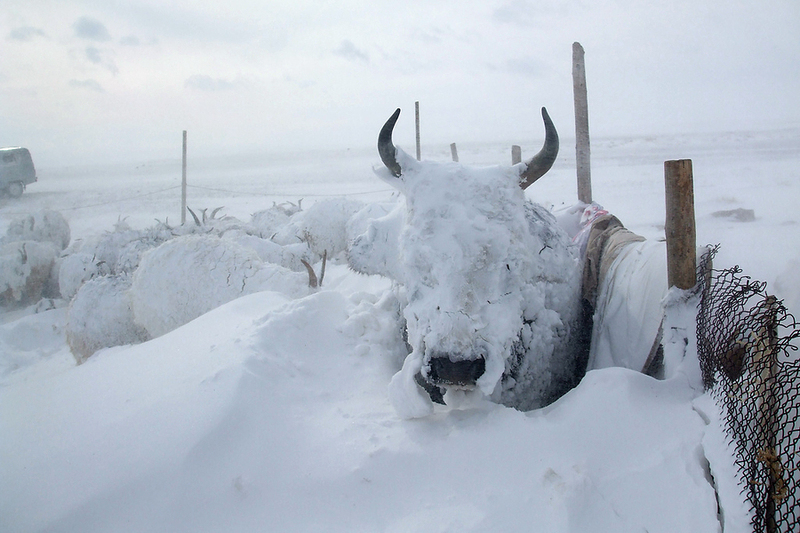 Years of chronic overgrazing coupled with a severe draught last summer left the sheep, goats, cows, horses and camels who live on the steppe weak and unable to gain weight and survive the harsh winter amid temperatures that have regularly dropped to 40 below zero. Dzuds usually occur in a five-year cycle. Just a short distance from the ger is a pile of around 100 animal carcasses, frozen stiff from the cold. Two chestnut goats are eating the stomach of another. Uvs Province, situated over 1,000 kilometers from the country’s capital, Ulaanbaatar, is among the areas hardest hit by this winter’s dzud. Although the weather is starting to warm, early spring is the hardest time for animals, when they are weakest, but with no grass to graze on. The UN reported that from January to March the number of livestock deaths across the country jumped from 40,000 to 360,000 due to heavy snowfall and frigid temperatures. The overall toll is projected to climb to 1.2 million over the coming weeks. A dzud in 2010 claimed an estimated 3.3 million livestock. In February, the International Federation of the Red Cross and Red Crescent Societies launched an appeal to help 7,000 of the most vulnerable herder households. They have been delivering food aid and cash grants to those struggling the most. UNICEF, the United Nations, Save the Children and People In Need are also working to help herders. The United Nations Population Fund is handing out dignity kits to women. Climate change is widely believed to be playing its part in the disaster. Temperatures this winter have remained below minus 40 for a prolonged period, placing too much stress on underweight animals. There has also been no rain since July last year so it was difficult to find grazing land for animals, or to prepare hay for winter. Herders rely on their animals for meat and milk; they also sell their skins and burn their dung for heating. Thus, heavy losses amid dzuds can push nomadic herders into poverty: they have no other skills, yet often feel compelled to abandon the steppe and move to the capital to try to earn money, said Dr Davaajargal Baasaansuren, Head of the Disaster Management Program at the Mongolian Red Cross Society. “For many, it is impossible to find a job when they come to the urban centers. They are forced to squat in the worst slums where there is no infrastructure,” he said. On the steppe, a two-hour drive from the Undurkhangai provincial centre, Bayankhand Myagmar cries as she stands by a pile of dead sheep and goats. The 50-year-old has lost 451 animals from a herd of 700. Outside her ger a handful of sheep, too weak to stand, are spasming on the dusty ground as they take their last breaths. Horses and cows wander around trying to find something to eat. The weakest wear handmade blankets made of clothes and household fabrics. To buy hay and animal fodder she has sold her car, which the family used to transport weaker animals to better pastures. She also says she is now in debt with local markets after trying to buy more hay.